WikiLeaks founder Julian Assange had the internet connection in his Ecuador Embassy residence cut off after getting in a Twitter debate with British officials about the timing of the expulsion of Russian diplomats over the Skripal case. Assange adviser and Australian barrister Greg Barns spoke to Sputnik about what makes this case so ludicrous. Sputnik: The Ecuadorian government’s decision was made amid concerns of violation of an agreement urging Mr. Assange to refrain from interfering in other states’ affairs. How justified are such concerns? Has there been any breach at all? Greg Barns: It needs to be remembered that Julian Assange is a publisher who is entitled to his views. The second point I would make is that Ecuador, all the way back in 2012, took the view that his freedom of speech was being severely impacted by the conduct of the United States, the United Kingdom and Sweden. They gave him asylum, and it's a very important right that one has to access the internet. This is not the first time this has happened. It happened during the US presidential election, when his internet was cut for a short time. Ecuador is in a difficult position – that's understood. But it's also understood that when a person seeks asylum, and a person is given asylum by a country, the rules that apply to every other person in that country should apply to that person. In this case, there are no other people in Ecuador who have their internet cut. So Ecuador obviously needs to understand and respect [his] right to use the internet. Assange's final message before his internet access was cut off, in response to a junior British Foreign Office official's insults. Sputnik: Do you feel that cutting off his internet is basically putting him in a situation akin to solitary confinement? There is a lack of evidence supporting the position taken by Theresa May and Australian Prime Minister Malcolm Turnbull this week in relation to the allegation that Russia has poisoned one of its ex-spies. What [Assange] was saying was not particularly controversial in the sense that many thinking journalists and commentators are making the same point. Similarly, in relation to the Catalan issue, there are varying views around the world on this, and if we're going to cut off internet access to anyone who holds these views, then we're going to be very busy because there would be millions of people who hold similar views to those that Julian holds. (2/3) That 21 US allies have expelled diplomats over an unresolved event in the UK and that the US expelled nearly three times as many diplomats as the UK, the alleged victim country, helps the Kremlin further a narrative that it is under conspiratorial siege led by the US. Assange's Tweets about the Skripal case. Sputnik: The asylum agreement says that Mr. Assange is to refrain from interfering in other states' affairs. Is it really possible that just by tweeting that he's somehow done so? Greg Barns: Well there's no doubt that that agreement is a very tight agreement, and very tightly drafted, and rightly so, because it does give him freedom to use the internet. It could not be said, even in the biggest stretch of interpretation of those words, that merely tweeting or commenting on issues in the same way that millions of people around the world are tweeting on these issues, and having those views, could be said to be interfering in the affairs of another state. Otherwise, all of those people around the world who hold similar views in relation to the Catalan issue, or to Theresa May's hysterical claims, would be interfering in the affairs of a foreign state, and that's absurd. Sputnik: Do you think that it is Assange's comments on the Skripal case that caused this cutoff? Greg Barns: I can only speculate, because there seems to have been some information from Ecuador that that was the case. I'm saying is that if that is the case, then it's wrong. It's very concerning that there is a real lack of evidence to suggest that Vladimir Putin and the Russian government had any involvement at all in [Salisbury] to [the Skripals]. If it's said then that I'm interfering in the affairs of another state, so be it. 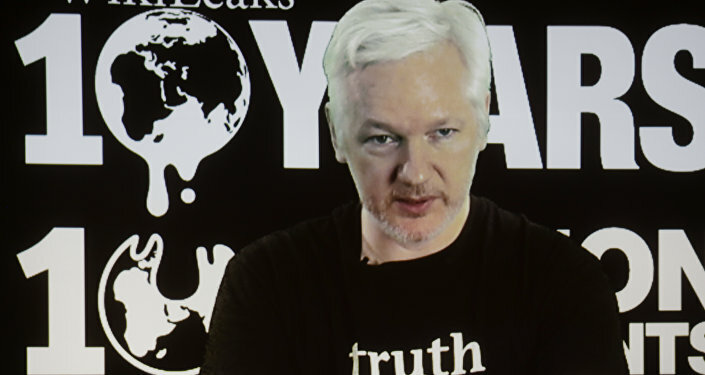 But there are many people around the world who would share Julian's views, and certainly they are views that I support. Sputnik: What would be the response if anybody else, be it a citizen or a government was punished with the wording 'highly likely'. Wouldn't there be a negative response if an alleged criminal was sent to jail using this sort of language? Greg Barns: I totally agree with you. Here in Australia, Prime Minister Malcolm Turnbull announced the expulsion of two Russian diplomats purely on the basis of the same — I'll call it a lie, the lie that Theresa May told the British House of Commons on the 12th of March, in which she said that it was interference by Russia. And yet when one read what the UK High Court had to say about the matter on the 22nd of March, and what the scientists had to say, it was certainly not clear. And yet we've seen this hysterical rush to judgement, and a sort of hysterical anti-Russian sentiment, which exists certainly in Australia and exists in the UK, which has meant that we have this gross hypocrisy now. Because we know that the United States routinely interferes in the affairs of other countries, routinely kills innocents by virtue of its drone program, and yet we don't see any efforts by Australia or the United Kingdom to expel diplomats…[As for the Russia claims they are] well short of the sort of proof one requires in making a very serious allegation. Julian Assange has been confined to the Ecuadorian Embassy in London since 2012 for fear of being extradited to Sweden on sexual abuse allegations. Sweden dropped the charges after a seven year investigation, but British police said that they would still arrest the whistleblower if he stepped foot out of the embassy. The views and opinions expressed by Greg Barns are those of the speaker and do not necessarily reflect those of Sputnik.